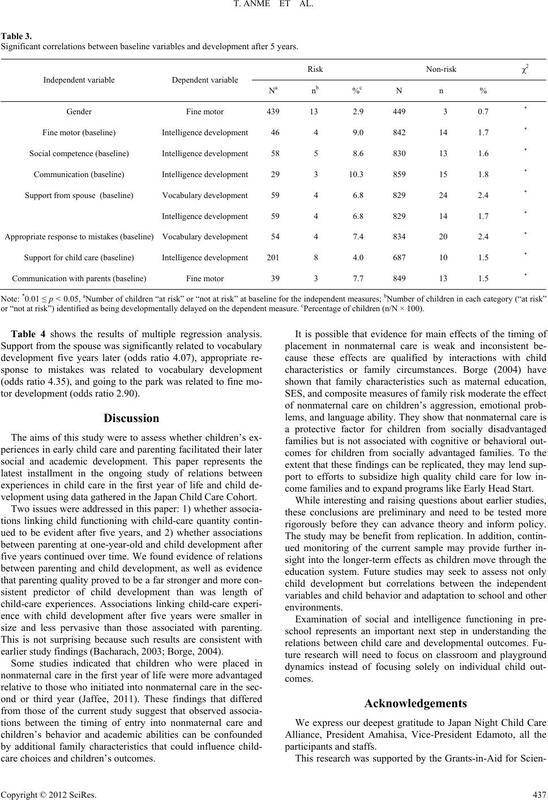 early extended child-care experience, support from the spouse predicted higher vocabulary development. vocabulary/motor/intelligence development after five years. girls, 439 (49.4%), was fairly even. the health and disabilities of the children. sponses (yes/no) to thirteen activities in the home environment. ciated with fine motor development. Percentage of group at risk. Significant correlations between baseline variables and development after 5 years. or “not at risk”) identified as being developmentally delayed on the dependent measure. cPercentage of children (n/N × 100). Table 4 shows the results of multiple regression analysis. tor development (odds ratio 2.90). 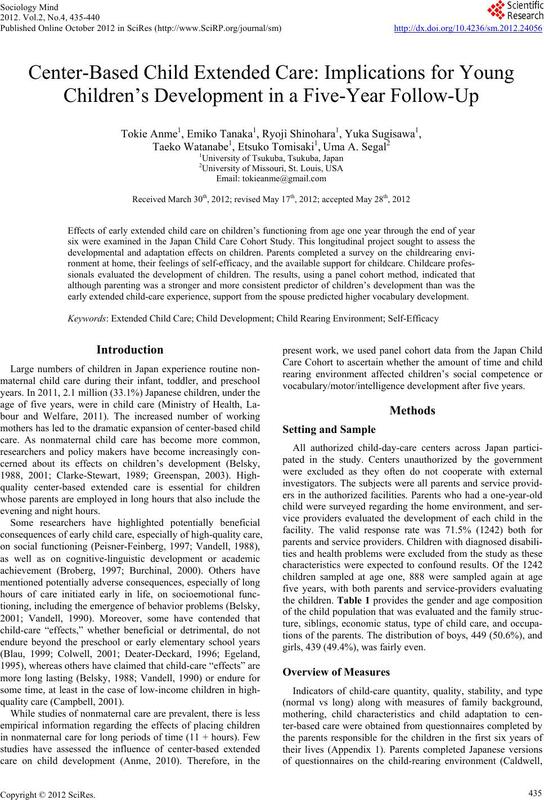 velopment using data gathered in the Japan Child Care Cohort. size and less pervasive than those associated with parenting. earlier study findings (Bacharach, 2003; Borge, 2004). care choices and children’s outcomes. come families and to expand programs like Early Head Start. rigorously before they can advance theory and inform policy. Correlation with risk factors following four year in care (multiple regression analysis includes all items—see below). line)—b, vocabulary (baseline)—c, *(a-c) baseline variable was only input when that particular variable was being assessed. vices Risk Assessment, 9, 37-47. Yew Chung Education Publishing Company. 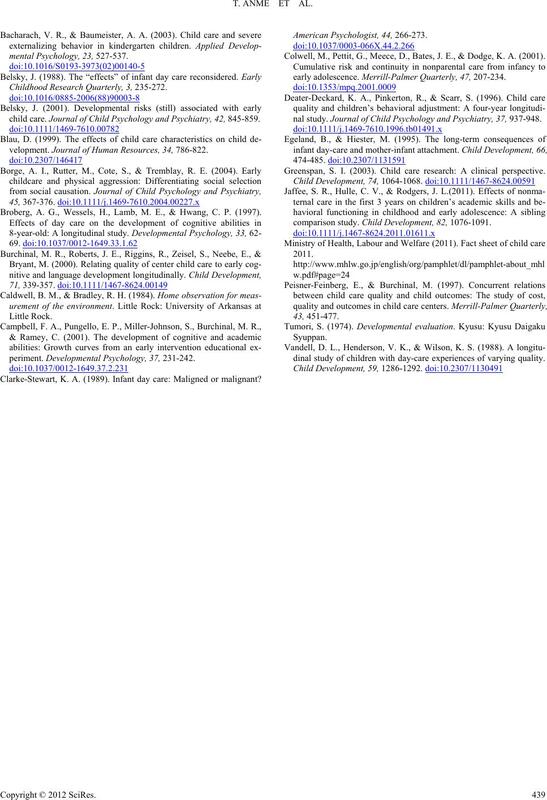 Childhood Research Quarterly, 3 , 235-272.
child care. Journal of Ch ild Psychology and Psychiatry, 42, 845-859.
velopment. Journal of Hu man Resources, 34, 786-822. Broberg, A. G., Wessels, H., Lamb, M. E., & Hwang, C. P. (1997). periment. Developmental Psychology, 37, 231-242. Clarke-Stewart, K. A. (1989). Infant day care: Maligned or malignant? Colwell, M., Pettit, G., Meece, D., Bates, J. E., & Dodge, K. A. (2001). early adolescence. Merrill-Palmer Quarterly, 47, 207-234.
nal study. Journal of Child Psychology and Psychiatry, 37, 937-948. Greenspan, S. I. (2003). 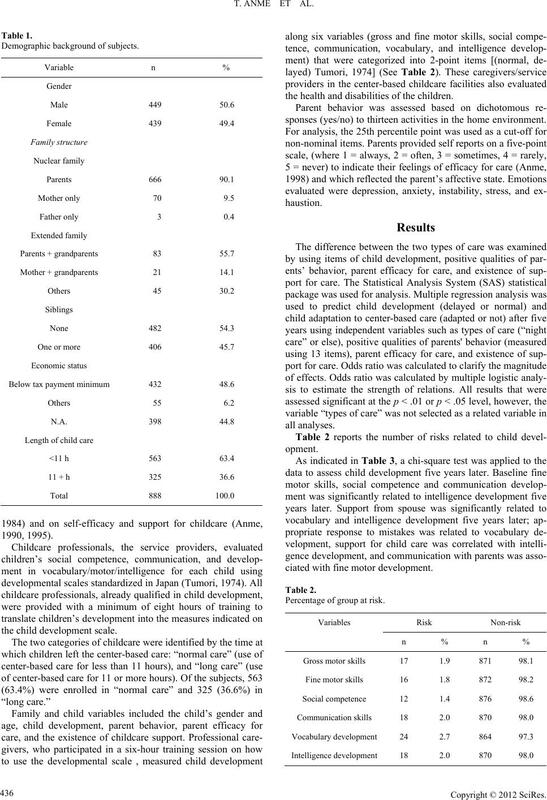 Child care research: A clinical perspective. comparison study. 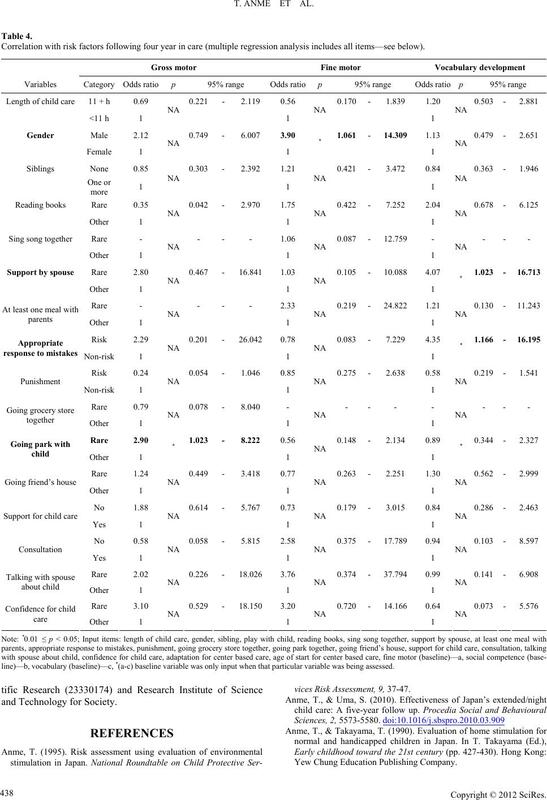 Child Development, 82, 1076-1091.
dinal study of children with day-care experiences of varying quality. 1. How often do you play with your child per wee k? 2. How often do y ou go shopping with your child? 3. How often do you read to your child? 4. How often do you sing songs with your child? 5. How often do you go to the park with your child? relatives with children of a similar age? help you with the child? 9. What do you do if your child spills milk purposely? 12. Does someone help you take care of your child? 13. Do you have someone to consult with about childcare?